It’s no secret that we’re living in uncertain times, especially when it comes to the state of the media. Fake and unsubstantiated news is being shared at an alarming rate, and sometimes it can be difficult to figure out what information is true and what information has been altered or made up in order to deceive. That is why, as the editor-in-chief of Hefty Dog magazine, I am making this solemn vow to all of our readers here and now: In this age of misinformation, I swear that the staff of Hefty Dog magazine will bring you only the most accurate information about overweight dogs that we possibly can. For over 100 years, Hefty Dog magazine has brought our readers countless articles about dogs that are very fat. Our audience relies on us to tell them honestly every time an extremely wide dog gets stuck in a window or eats an entire pumpkin. That has always been our editorial mission and always will be. However, in this chaotic time in our country and in our world, misleading journalism has become as commonplace as it is pernicious. It is easier than ever to fabricate stories about fat dogs and the people who love and fear them. But I swear to you that Hefty Dog magazine will never lie to you. When you read a story in Hefty Dog about a dachshund who needs to be wheeled to the toilet in a Radio Flyer wagon because he’s too heavy to walk on his own and too fat to fit through the door to go to the bathroom outside, you can rest assured that such a story is totally verified and accurate. Sadly, this promise for absolute journalistic integrity is no longer something you can rely on from lesser publications in the world of overweight dog news. They’ll try to pass off pregnant dogs as obese dogs, or try to doctor photographs to make it look like a greyhound’s stomach is so big that it’s dragging along the ground. These falsified stories are unconscionable and make a mockery of the entire institution of journalism about fat dogs that waddle around eating everything they can find including wads of newspaper and model trains. I consider it my sacred duty as the editor of Hefty Dog magazine to make sure our readers never have to worry about this kind of fake news. When you see an obese Labrador sitting in a woman’s lap, the look of agony on the woman’s face is absolutely real. As heart-wrenching as it would be, we would rather report that every dog on Earth is a healthy weight than lie about a single story about a fat dog. If we cannot find three independent sources to confirm a dog is fat, we don’t report on it. Simple as that. Last month, there were unproven rumors circulating that the world-famous Kronos The Impossible Bulldog had stepped on his owner’s legs with all 250 pounds of his sky-darkening frame, shattering his owner’s shinbones and sending him to the hospital. The report was unconfirmed and the sources were not vetted, yet many of our competitors, including such once-respected publications as Ample Hound Quarterly and The Journal Of Furniture-Shaking Canines, were quick to report this unverified story simply because they wanted their content to go viral. They didn’t care if the story was true or not; they just knew that articles about miraculously bloated dogs who crush their owner’s legs yield attractive metrics on social media. On the other hand, those of us on the staff of Hefty Dog magazine declined to report the story. We knew our readers loved Kronos The Impossible Bulldog, but we refused to publish any article based on such flimsy evidence. Sure enough, it was later revealed that the original story was grossly inaccurate. Kronos The Impossible had not stepped on his owner’s legs; he had stepped on his owner’s head. And he had not sent his owner to the hospital; he had killed him. That was the story that we reported in Hefty Dog magazine. We were the only ones who reported the truth. This is the sort of commitment to the facts that our readers can expect. 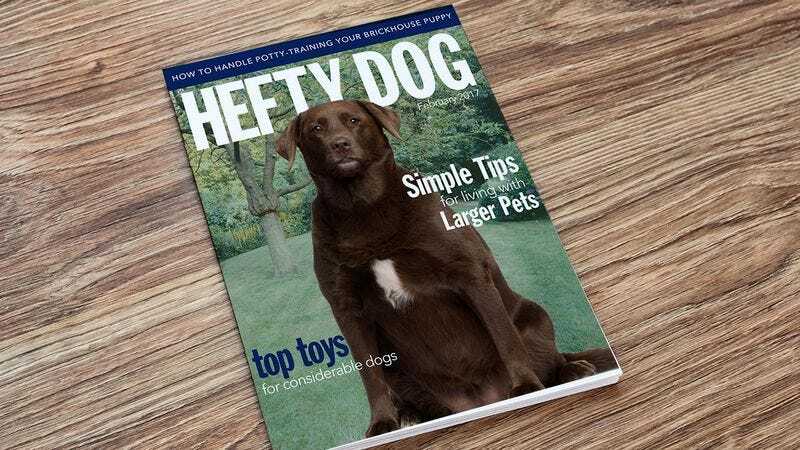 While uncertainty and deceit dominates much of the media landscape today, we here at Hefty Dog magazine will always remain dedicated to bringing news about overweight dogs to our readers with the honesty and the commitment to principle that has made us the standard-bearers in fat-dog journalism for over 100 years.